Officer Sidney Riegel, 44, was a 15-year veteran of the LAPD, and was assigned to the Van Nuys station as a member of the elite plainclothes Felony Unit. At about 1 a.m. on Saturday, May 6, 1961, Riegel and three other members of the Felony Unit were sent to a housing project at 12923 Pierce St. in Pacoima to arrest several men wanted for the armed robbery of a liquor store, which netted an unknown amount of cash, and $8.65 worth of beer and cigarettes. As officers were entering the first floor of the two-story building, they came under fire from a man on a second-floor balcony, armed with a .38-caliber revolver. Both Reigel and his partner, Officer Ron Traurig, 28, were hit, but both officers were able to return fire. The man jumped from the balcony and escaped, but eight other men in the building were arrested. Reigel and Traurig were taken to Valley Receiving Hospital in Van Nuys, where Riegel was pronounced dead. Traurig was hit in the right side and the leg, and recovered. Hundreds of police officers searched for Reigel’s 30-year-old killer, who had a rap sheet with more than 20 previous arrests for burglary, robbery and narcotics violations. Nearly two weeks after killing Riegel, the man surrendered to a Los Angeles newspaper reporter and photographer, who contacted police. In November 1961, six months after the gun battle, he was tried and convicted of first-degree murder, and sentenced to life in prison. Riegel, a World War II veteran, was survived by his wife, Dorothy, and two daughters, Caren, 7, and Elaine, 5. 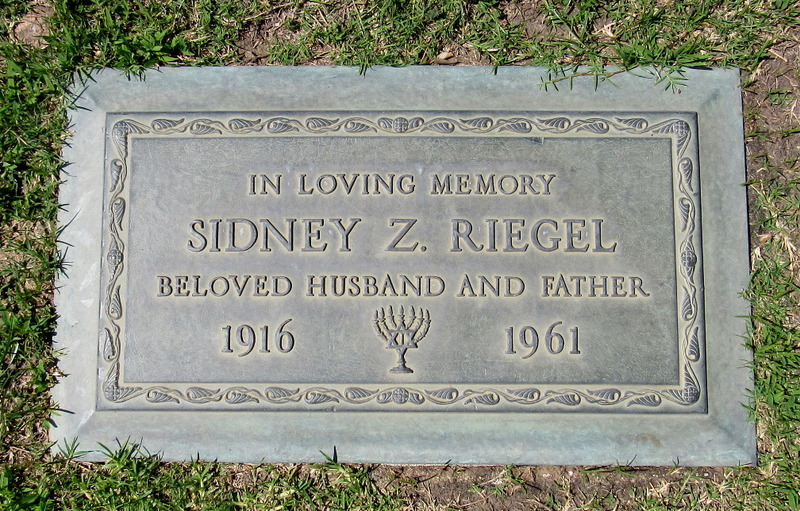 Riegel is buried at Eden Memorial Park in Mission Hills. His widow died in 2014, at the age of 94, and is buried next to him. Riegel's sign is located on the south side of Pierce Street in Pacoima, just west of Pala Avenue. directly across the street from the scene of the shooting.